Using various LayoutManagers one can provide spacing between various components. JToolBar has the methods addSeparator() & addSeparator(Dimension). JMenu uses a spacing component better suited to menus, available through addSeparator(). 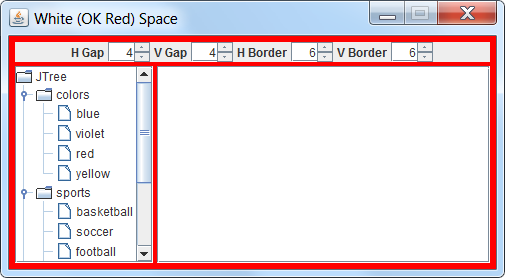 The spacing as can be defined in the layout constructors. Here is an example of using the layout separator hGap & vGap values & borders (specifically an EmptyBorder) to provide 'white' (actually shown as red to make it very obvious) space. Adjust the spinners to see the result. When you use BoxLayout, Box.createVerticalGlue() method can help you to make some white space. Another method is BorderFactory.createEmptyBorder(int top, int left, int bottom, int right). It can help you to make some white space around component. Thanks for Andrew Thompson's remind.I've revised BoxLayout in recent days and I find that Box.createVerticalGlue() can add some white space depend on the panel's size and you can not set the explicit pixel value of the length of white space.But Box.createVerticalStrut() can do that. Here is a MCTaRE and show the effect of those two methods. Box.createHorizontalGlue() and Box.createHorizontalStrut(int height) can be used too. Besides, Box.createRigidArea(Dimension d) has the ability too create white space too. MigLayout has multiple ways of creating space. (A space is called a gap in this layout.) 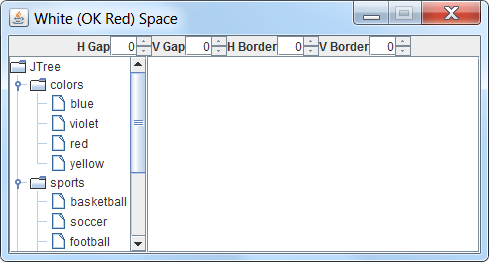 Gaps can be created at the highest level with layout constraints, it is possible to create gaps between rows and column and gaps can be also set between individual components with component constraints. There are also specific gaps around the borders of a container called insets which have their own specific keyword to be set. We have four panels in the layout. Each of this panels has a MigLayout manager. This line creates container insets and vertical gaps between panels. Here we apply gaps for the whole grid structure and also set container gaps. This line creates gaps between columns. Row gaps are defined with this code. Finally, it is possible to create gaps between individual components. Author Karsten Lentzsch has a collection of presentations on UI design. In particular this PDF speaks to the need for aesthetic whitespace. Adding meaningful space while also paying attention to clutter separates the wheat from the chaff. Not the answer you're looking for? Browse other questions tagged java swing whitespace layout-manager or ask your own question. How to best position Swing GUIs? How to put integer value in JLabel? How to set the white space size in CoreText?